Weeks before planned elections and a papal visit, the government tries to curb inter-religious fighting in Bangui; yet politico-religious rivalries and a lacklustre security response will intensify the level of violence. On 29 October, Interim President Catherine Samba Panza replaced the ministers of defence, justice, and public security. The CAR is due to hold presidential and parliamentary elections on 13 December, yet the lead-up to the polls has been marked by inter-religious violence that has killed at least 77 people in the capital Bangui since September. Pope Francis recently indicated the Vatican might cancel an upcoming trip to CAR due to the violence. The cabinet shake-up is in response to security forces’ inability to curb violence between Christians and Muslims. On 27 October, 200 youths blockaded roads in Bangui following the abduction of Christians in the mostly Muslim area of PK-5, possibly by the mostly Muslim Séléka militant group. 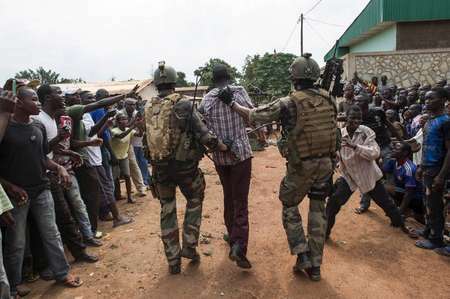 The abductions were likely in response to attacks on a Séléka motorcade, which has been blamed on the Christian self-defence militia anti-Balaka, yet is more likely to have been staged by a radical anti-government Séléka faction, the Popular Front for Rebirth of the Central African Republic, which has recently allied anti-Balaka forces loyal to former president François Bozizé, who was overthrown by Séléka forces in March 2013. The political and religious rivalries between the various armed groups and rival supporters of Catherine Samba Panza and François Bozizé have intensified the violence and the security response has been lacklustre. Lynchings, arson attacks, targeted assassinations, looting, and street battles are again common place in the worst violence since massacres in December 2013. Risk implications: The various constituent groups that compose the anti-Balaka and Séléka are so divided that any reduction in violence before the elections is highly unlikely. The United Nations Multi-dimensional Integrated Stabilisation Mission in the Central African Republic (known as MINUSCA) has also been ineffective in restoring order. France’s Opération Sangaris intervention force now only numbers some 500 troops and has reduced its interventions. It is therefore unlikely that the sudden security cabinet reshuffle will have an impact on the violence in Bangui. Preparations for the elections and constitutional referendum are under-funded and behind schedule, with many voters in high risk areas still unregistered. NGO and election workers will face high risk of attack over the next few weeks around the elections, if these are not postponed for a fourth time. Attacks will also become more likely on the highly unpopular MINUSCA forces by all armed groups in CAR. Copper and gold mining cargo shipments face delays and risk of attack. Access to the airport and general aviation is also likely to face disruption and increased risk of shootdown by light arms. If the Pope’s visit in November does go ahead, security provisions by MINUSCA, the military, and even French forces will mitigate risk of attack on the papal delegation.